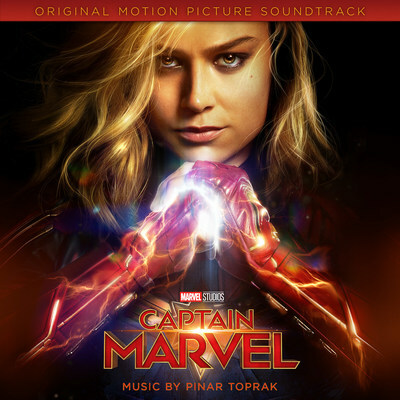 BURBANK, Calif., March 8, 2019 — (PRNewswire) — Marvel Music/Hollywood Records are releasing Marvel Studios' Captain Marvel digital soundtrack, featuring an epic orchestral score by award-winning composer Pinar Toprak. Marvel Studios' Captain Marvel opens in U.S. theaters today. Toprak's diversity as a composer is evident in her body of work ranging from the jazz-inspired score for "Purl" a new Pixar SparkShort, the TV series "Krypton," the hugely popular video game "Fortnite" to "The Wind Gods" documentary. The film's directors Anna Boden and Ryan Fleck said, "We loved that Pinar was willing to take some wild swings with her music in her early demos. Not all of it is in the movie, but it was her fearlessness and playfulness and the emotional resonance in the music that really surprised us. Her ability to balance all of that while still managing to make a cohesive, singular score is what most impressed us." On working with Boden and Fleck, Toprak commented, "We clicked from the start and wanted to find the right sound for the Cosmic scenes and how we can bring the 90s Earth feel into the score...our sensibilities really did match and it's been a wonderful collaboration." Toprak's score is a blend of electronics and orchestra, and was recorded with 90 musicians at London's Abbey Road Studios. On her theme for "Captain Marvel," Toprak said to Variety, "She's one of the most powerful beings in the universe, but she's also very human. Emotions don't take away from her strength. She's strong yet sensitive. I wanted to hear the humanity instilled in the hero." Marvel Studios' Captain Marvel Original Motion Picture soundtrack can now be streamed HERE and downloaded HERE. From epic orchestral scores for superhero sagas to custom created sounds for one of the world's most popular video games, composer Pinar Toprak brings versatile stories to life by creating a unique sound and mood to her projects across medium, genre and tone. Pinar's most recent work is for Marvel Studios' "Captain Marvel," starring Brie Larson. Additionally, Pinar composed the jazz inspired score for the Pixar SparkShort, "Purl" about an earnest ball of yarn who gets a job and finds herself asking how far she is willing to go to fit in and get the acceptance she yearns for. Having studied and practiced music from a very young age, Pinar earned a degree in film scoring and a master's degree in composition at age 22 before working alongside legendary composers including Hans Zimmer and William Ross. Pinar then went on to make a name for herself scoring dozens of projects across many mediums including the massively popular video game "Fortnite," Syfy TV series "Krypton," thriller "The River Murders," period drama "The Lightkeepers" and additional music on box office hit "Justice League." Her additional credits include the films "Behind Enemy Lines II: Axis of Evil," "The Challenger," "Breaking Point," "Light of Olympia," "Say It in Russian," "The Angel," and "The Wind Gods," video game "Ninety-Nine Nights," and TV series "Falling Water." Marvel Studios' "Captain Marvel" is produced by Kevin Feige and directed by Anna Boden & Ryan Fleck. Louis D'Esposito, Victoria Alonso, Jonathan Schwartz, Patricia Whitcher and Stan Lee are the executive producers. The story is by Nicole Perlman & Meg LeFauve and Anna Boden & Ryan Fleck & Geneva Robertson-Dworet, and the screenplay is by Anna Boden & Ryan Fleck & Geneva Robertson-Dworet. "Captain Marvel" opens on March 8, 2019 in U.S. theaters.